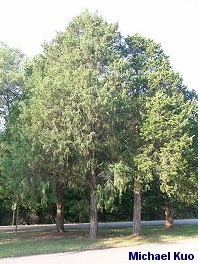 Small to medium-sized eastern conifer with scale-like mature leaves and pointy young leaves; bark reddish brown, in long strips; fruit a bluish berry. Habitat: Rarely in pure stands; usually mixed with hardwoods; common as a pioneer species in old fields and on poor, rocky soil. Stature: 30-40 feet high; 1-2 feet in diameter; pyramid-shaped or irregular. 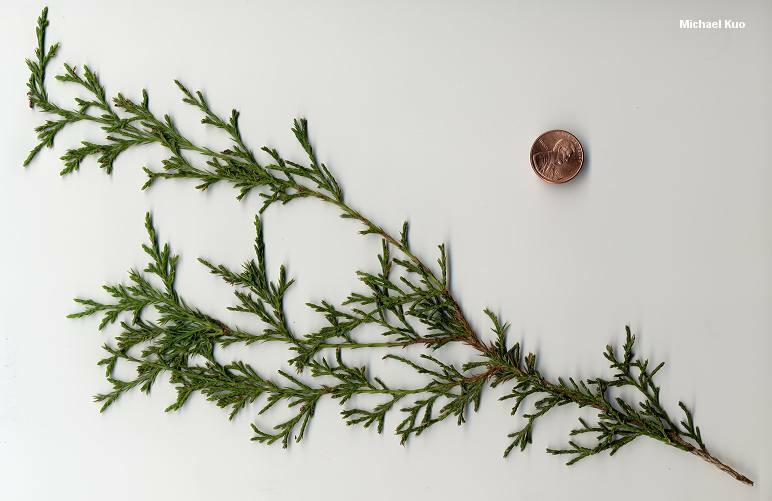 Needles: When young needle-like and sharp, about 1/2 inch long; when mature scale-like and tightly pressed to branchlets; dark green. 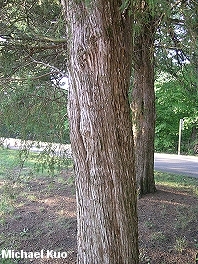 Bark: Thin; in hairy strips that begin to peel away; reddish brown. Fruit: Under 1/2 inch; bluish, with a whitish sheen; berry-like. 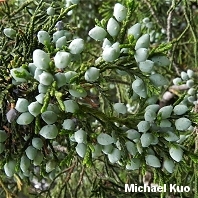 Gymnosporangium juniperi-virginianae (the "cedar-apple rust" that depends on eastern red cedar and apple trees to complete its life cycle), Trametes villosa, and others. 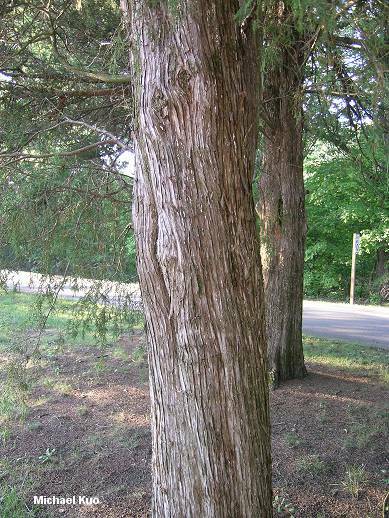 Morel hunters from Tennessee often claim to find morels under red cedar.